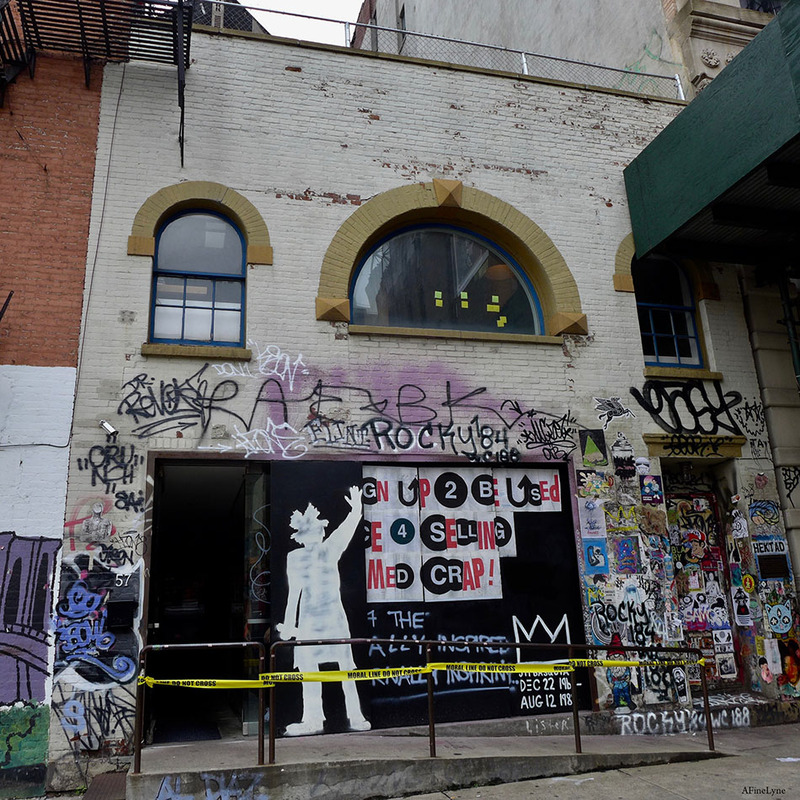 57 Great Jones, once owned by Andy Warhol, was the home and studio of Jean-Michel Basquiat. 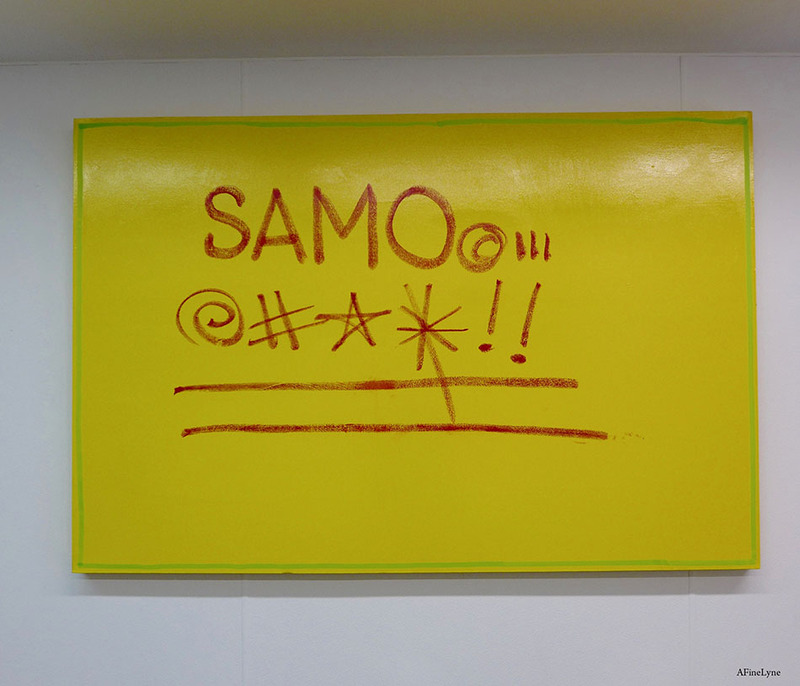 This month, the ground-floor space has been converted to a temporary gallery, inspired by the late artist ~ with an opening exhibition by Basquiat’s friend Al Diaz, also known as #SAMO, in honor of the 30th anniversary of the Basquiat’s passing. This historic 57 Great Jones property was purchased by Warhol in 1970. 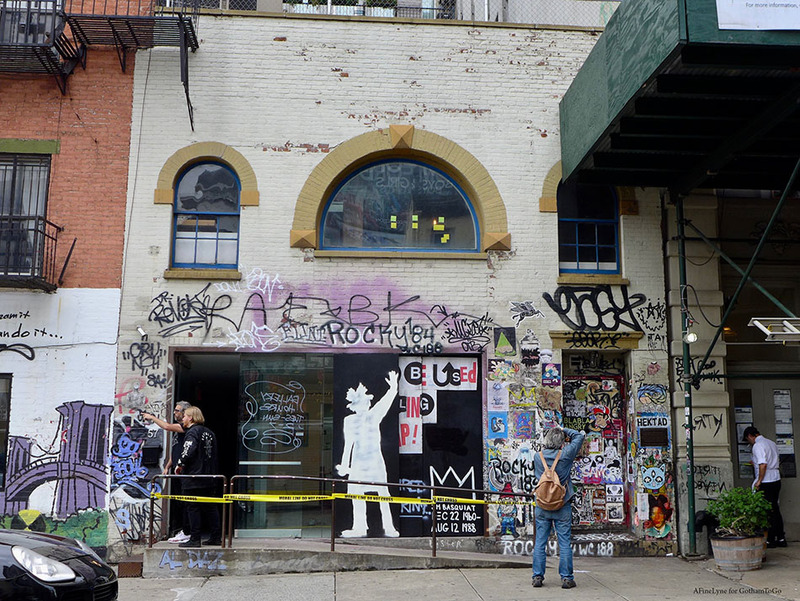 In 1983 it was rented to Jean-Michel Basquiat, who lived and worked in the space over the coarse of the next five years, until his death in 1988. 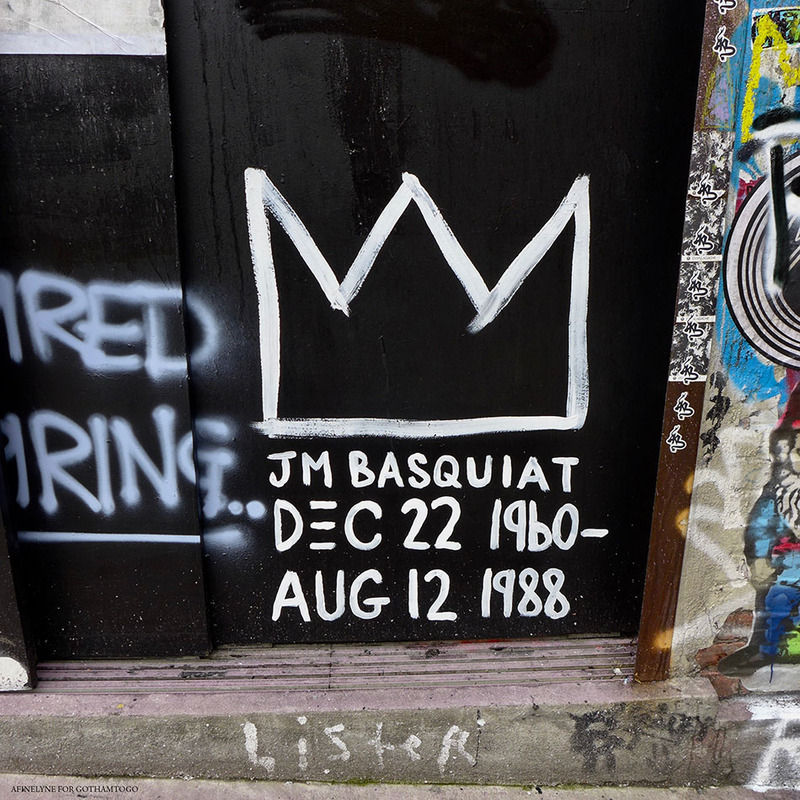 The exhibition, Al Diaz/Samo: Selected Multi Media Works, is in honor of the 30th anniversary of the passing of Diaz’s friend, Jean-Michel Basquiat. It will include new works and archival photographs from the 1970s. 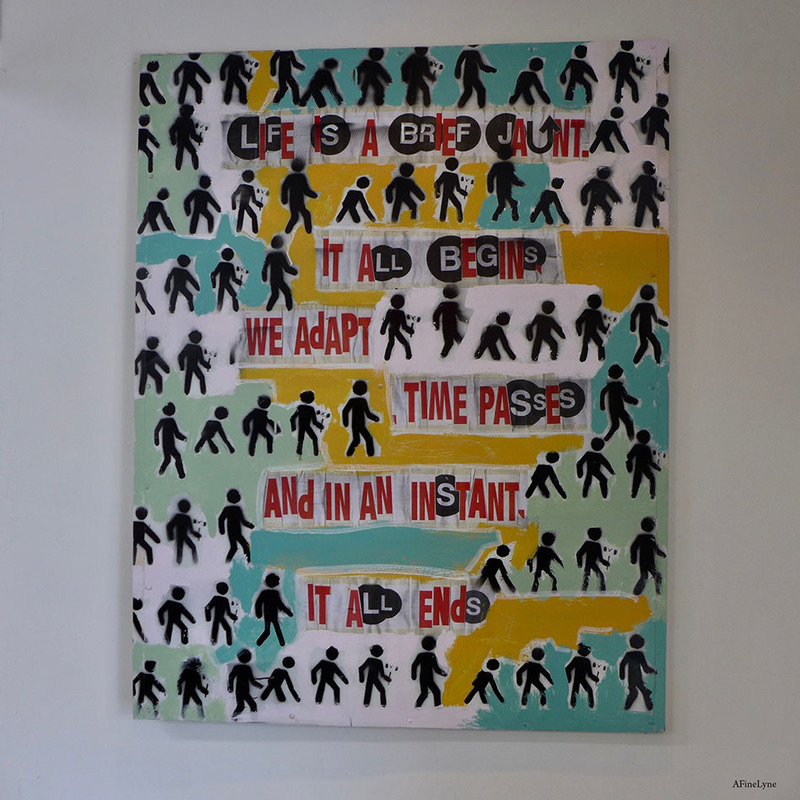 Curated by Adrian Wilson and Brian Shevlin, it will be on view at Same Old Gallery, 57 Great Jones Street to October 20, 2018. The Gallery is open Tuesday through Sunday from 2pm to 7pm. 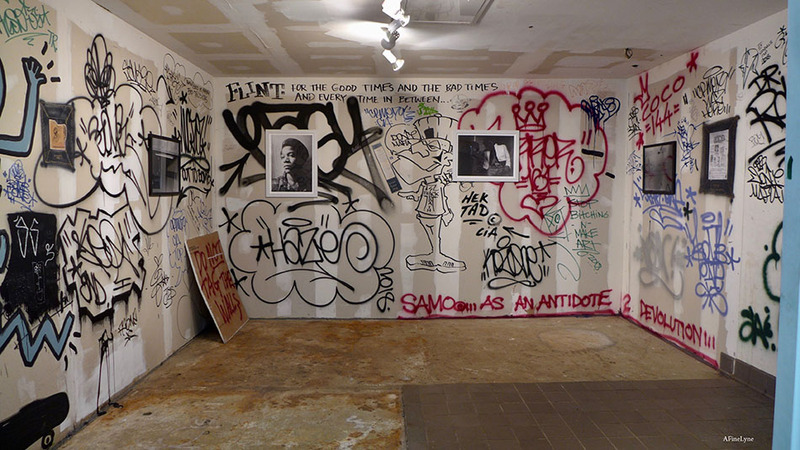 The three large paintings in the front of the gallery, Life is a Brief Jaunt, Flag (above), and Brain Damaged America, and the large piece in the main room entitled SAMO Profanity (below), are the most recently completed works. 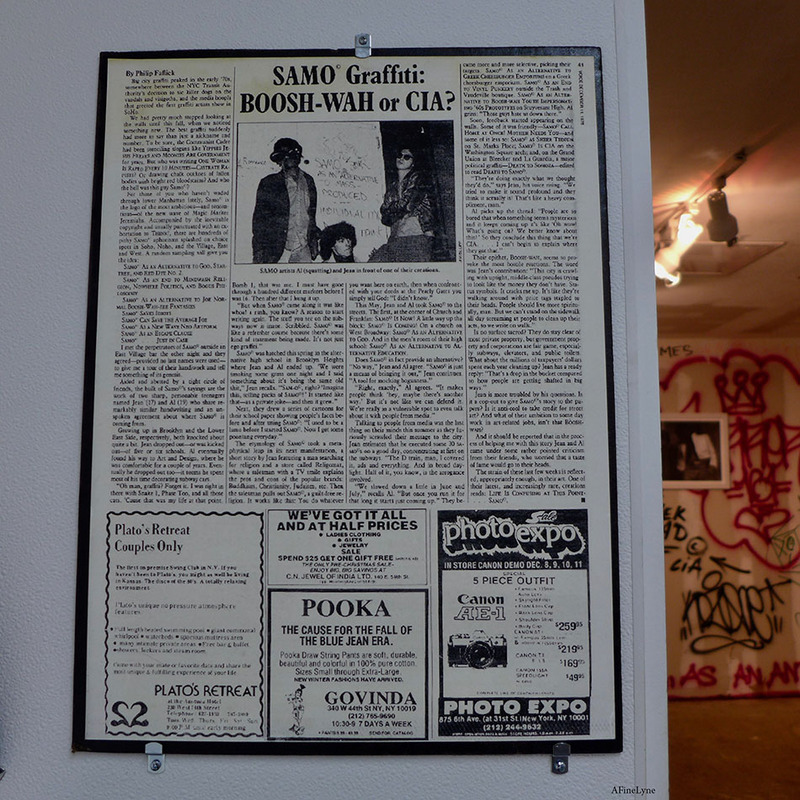 The 1978 school paper insert above was co-written and illustrated by Al Diaz and Jean-Michel Basquiat. 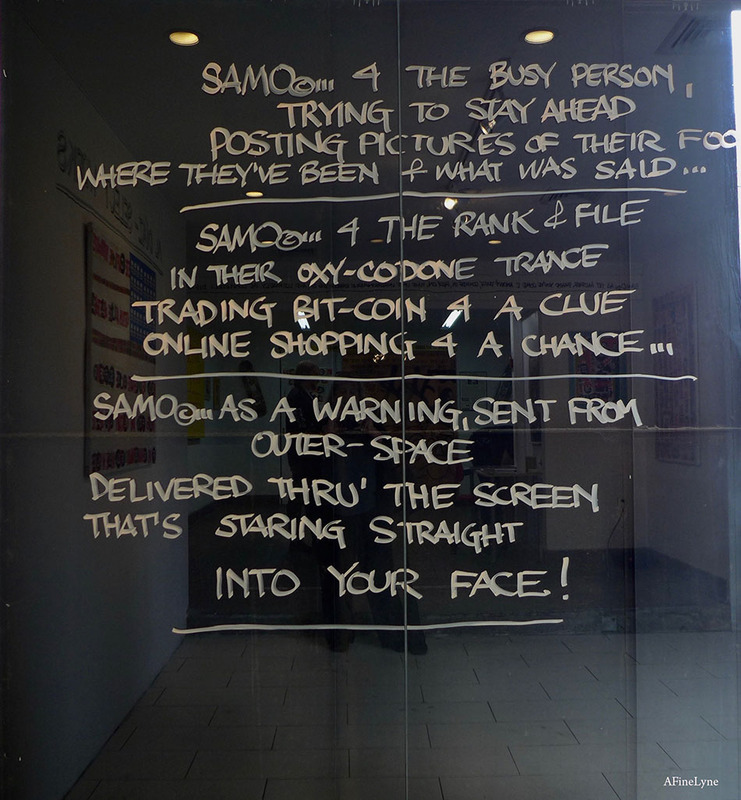 The positive response to the article and pamphlet set off a tagging/advertising/writing spree of SAMO sayings that subsequently appeared in subways, on walls, in hallways and stairwells in Soho, Tribeca, and Downtown. 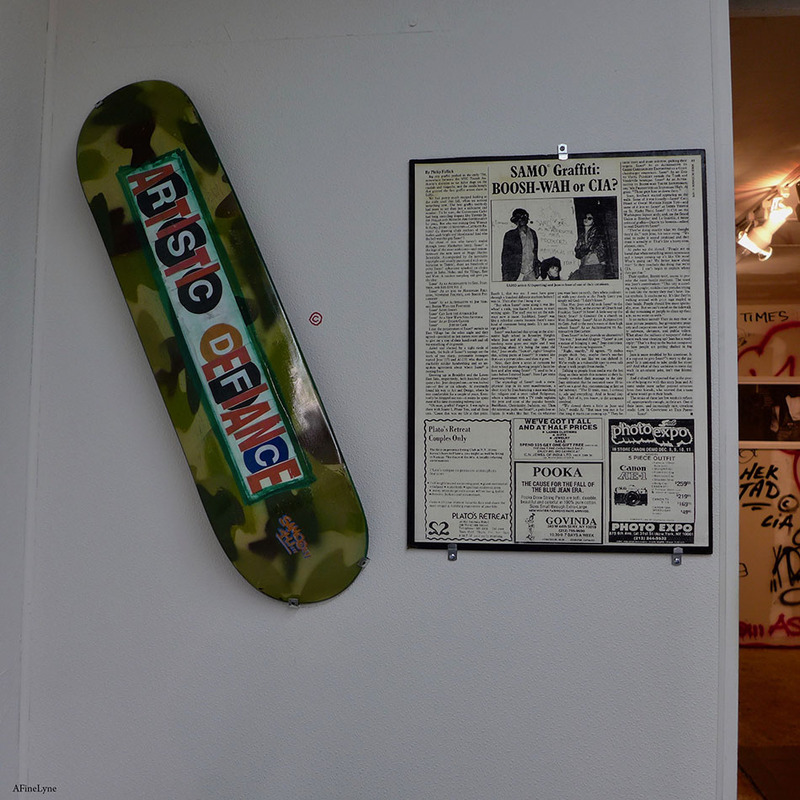 We spotted two customized skateboard decks. 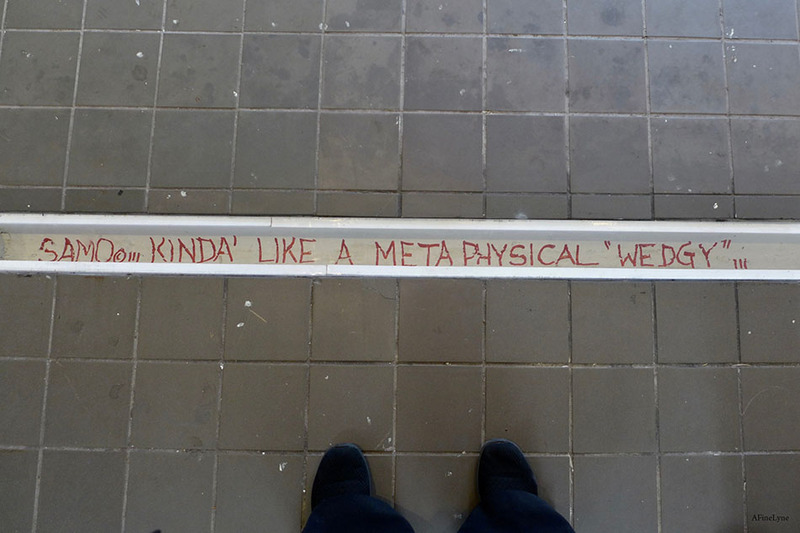 Above entitled Artistic Defiance and is mixed media on the skate deck. This particular one was sold, the other deck available so far and entitled, Create Agitate. 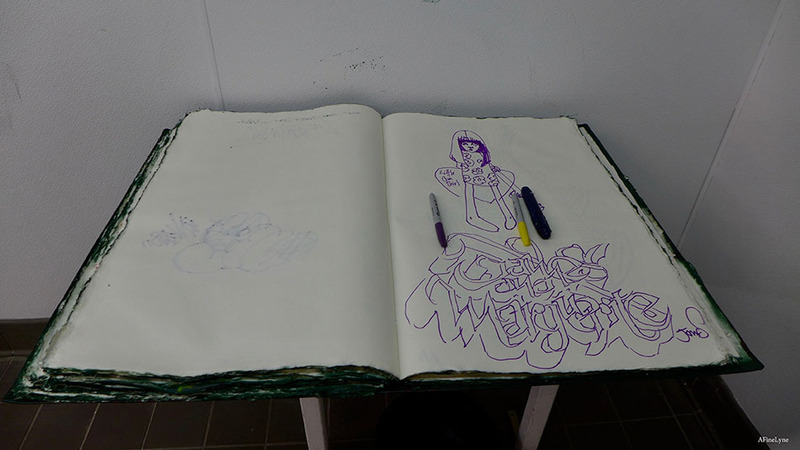 Every inch of the interior space of the two-room studio is filled with art, including a 3″ deep horizontal slice in the floor where a partition once stood (above). 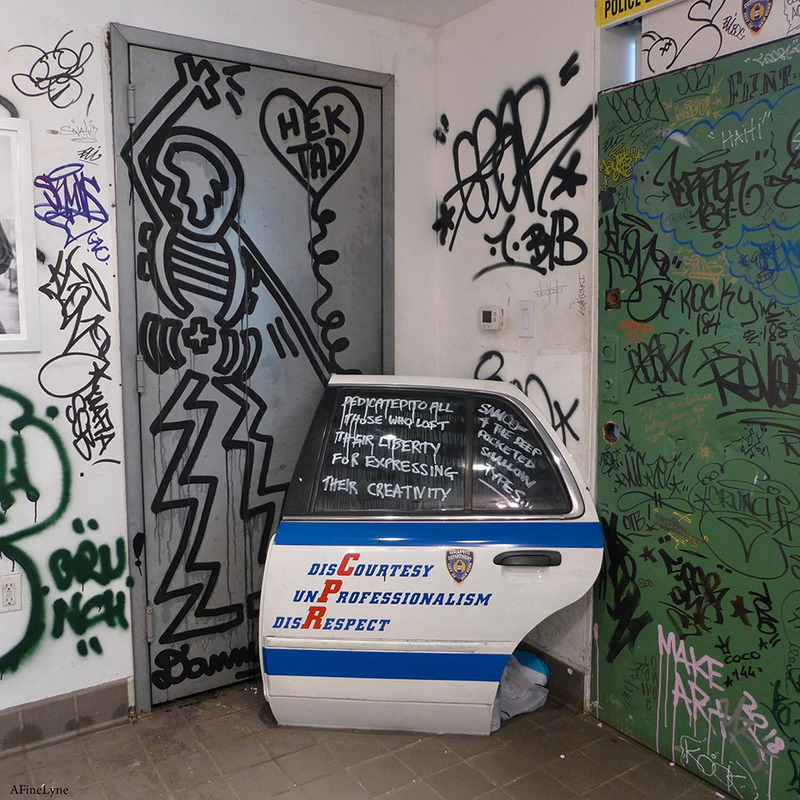 Above (door), ‘Creativity Vs Liberty‘, a collaboration with Adrian Wilson, mixed media on a car door. 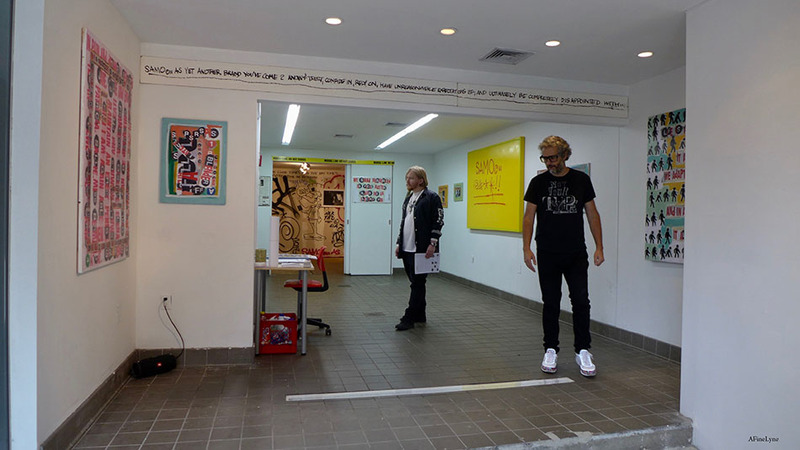 Below image taken of the entire first floor space, which includes two rooms, with artist/curator Adrian Wilson in the forefront. The exhibition is divided into two sections ~ new works and vintage photographs (below). Three of the photos are of a young Basquiat, taken by Diaz, printed in limited editions for this exhibition. 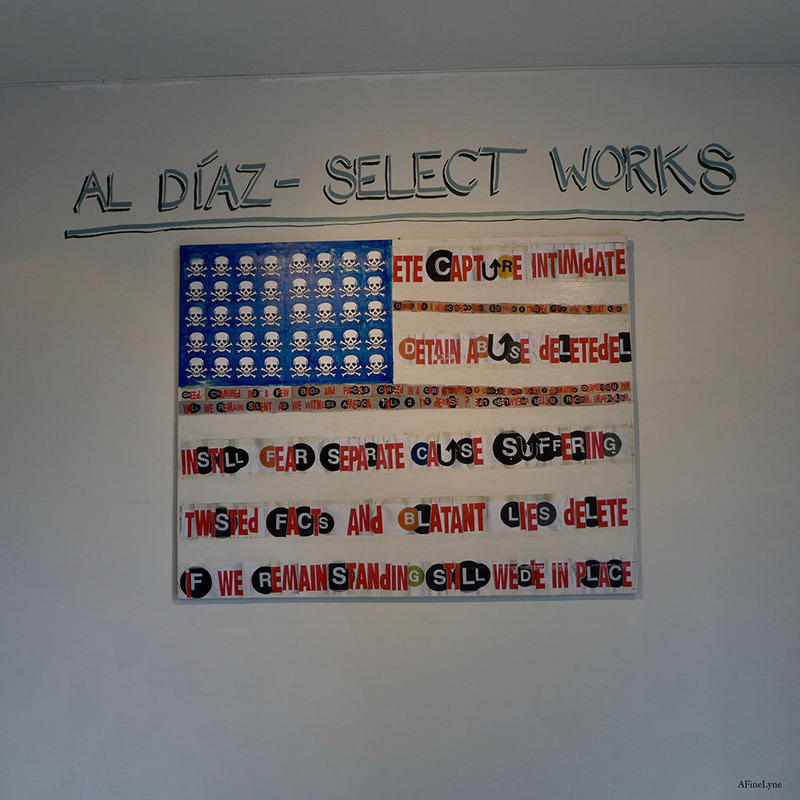 The photo’s are surrounded by the work of artists invited by Diaz to stop by and contribute. 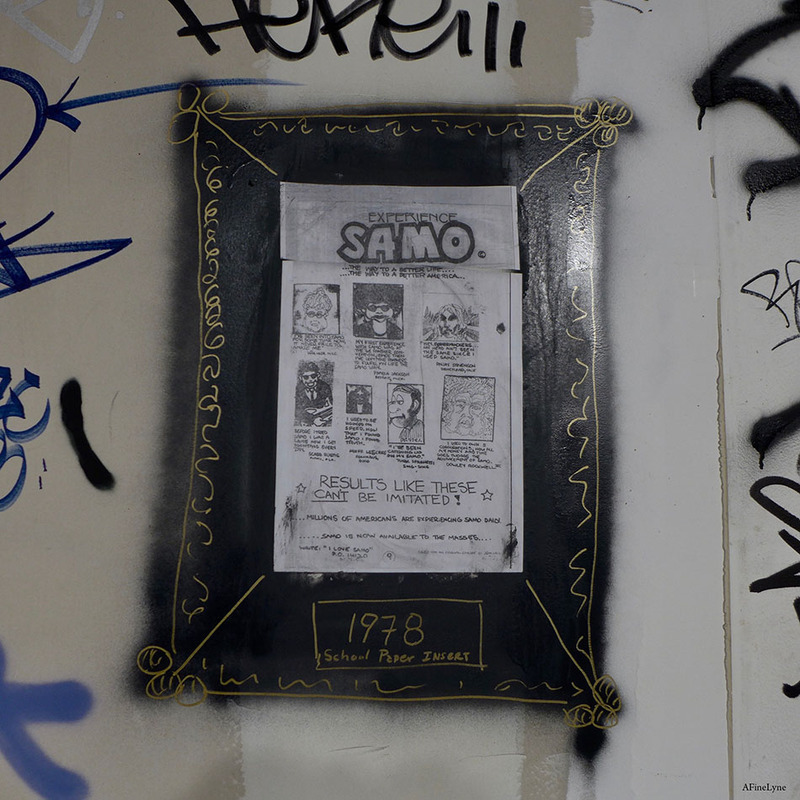 Above ~ the first public acknowledgment of the identity of SAMO was written by Philip Faflick of the Village Voice. Yes ~ you are welcome to create your message. 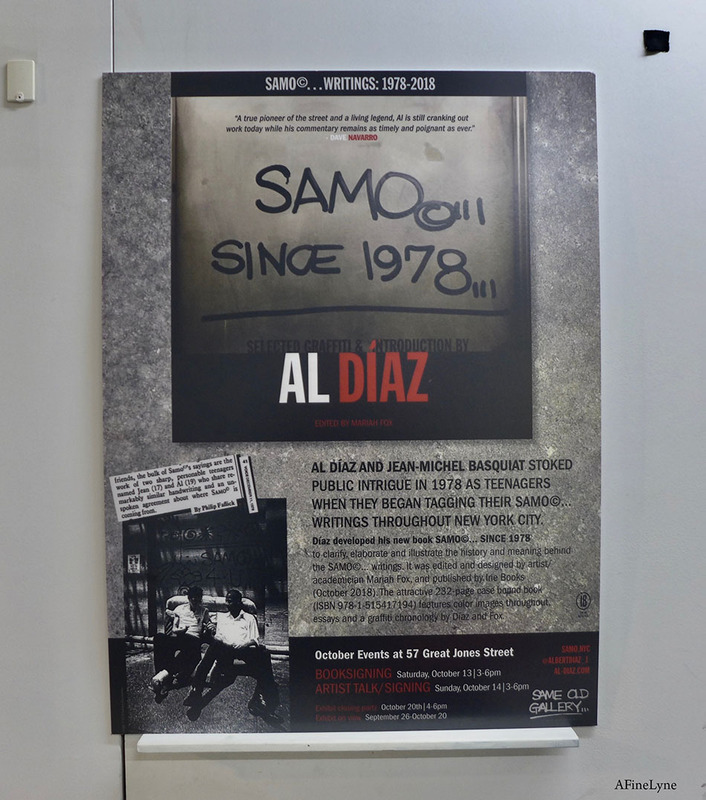 In addition to the exhibition Al Diaz/SAMO ‘Selected Multi Media Works‘, the artist will launch his new book, SAMO…Since 1978, a 232 page case bound book, with a book-signing to be held on Saturday, October 13 from 3-6pm, and an Artist Talk and Signing on Sunday, October 14 from 3-6pm. Today, 57 Great Jones Street, owned by a Japanese butcher, sits in the Noho historic district extension. 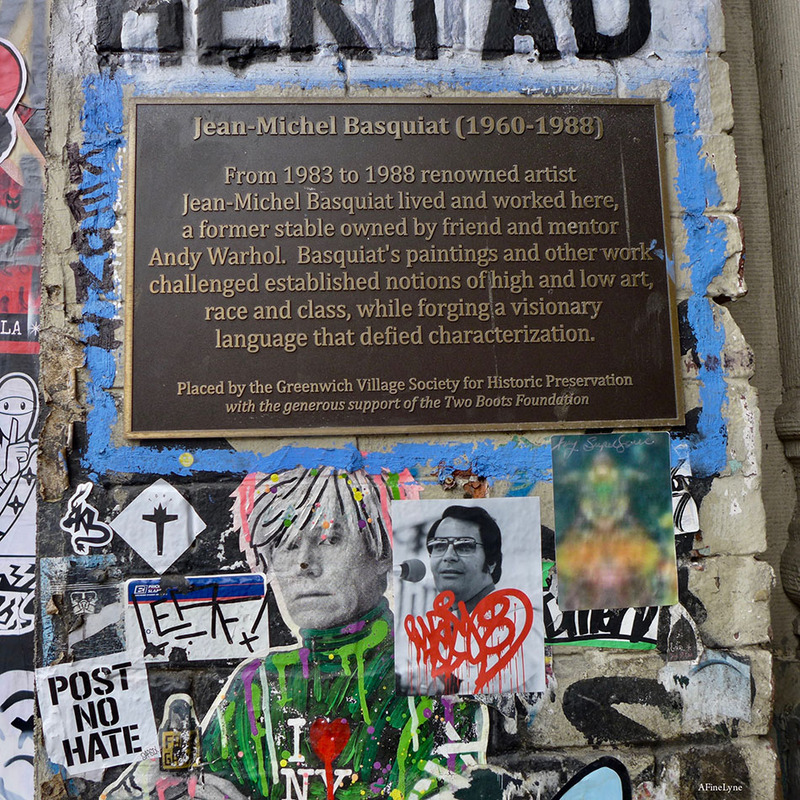 The building will soon make way for a restaurant ~ but maintain a plaque commemorating Basquiat on the face of the building, which was dedicated and installed in 2016 by the Greenwich Village Society for Historic Preservation. 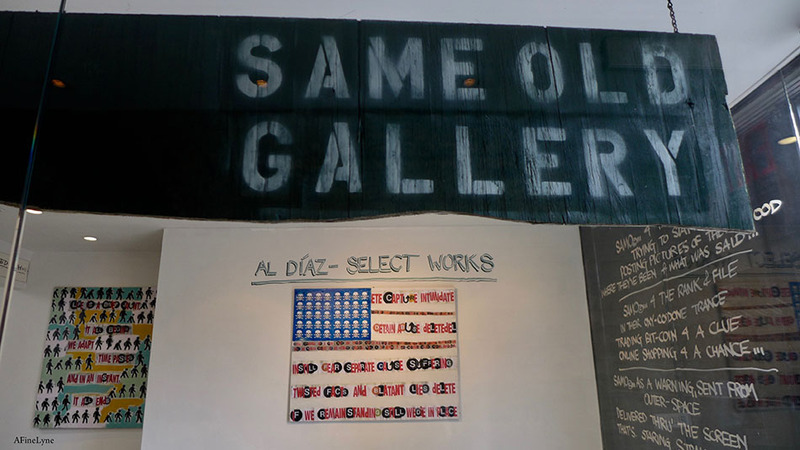 Al Diaz/SAMO ‘Selected Multi Media Works’ will be on view through October 20th, with a closing party on that day from 4-6pm at Same Old Gallery, 57 Great Jones Street in the East Village. 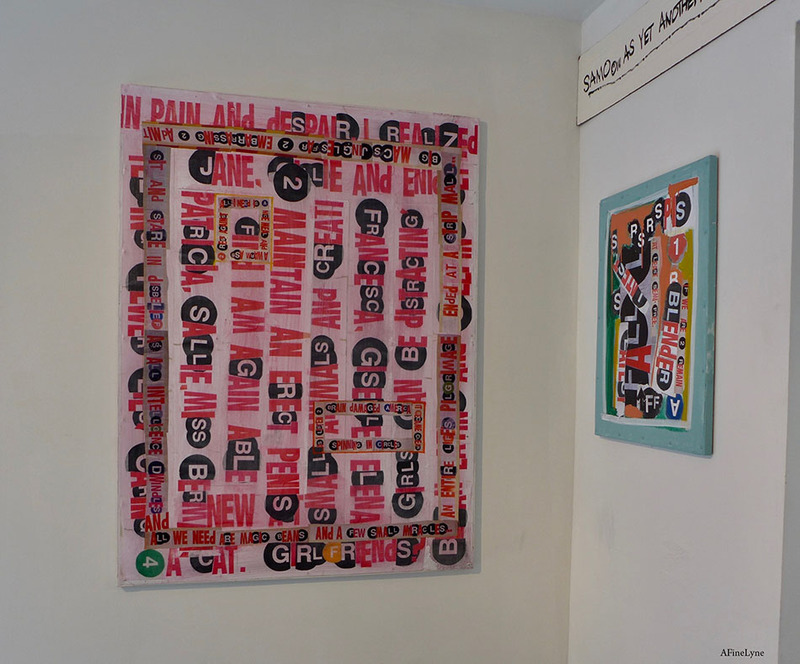 This exhibition has been curated by Adrian Wilson and Brian Shevlin. All works for sale, and although we noticed many were already sold, there are still a number of pieces available. Follow Same Old Gallery on Twitter and Instagram.